The meta description is a short text you can add to your post or page. It is sometimes shown in the snippet of your page in Google’s search results. A good meta description summarizes what the page is about and triggers people to visit your page. 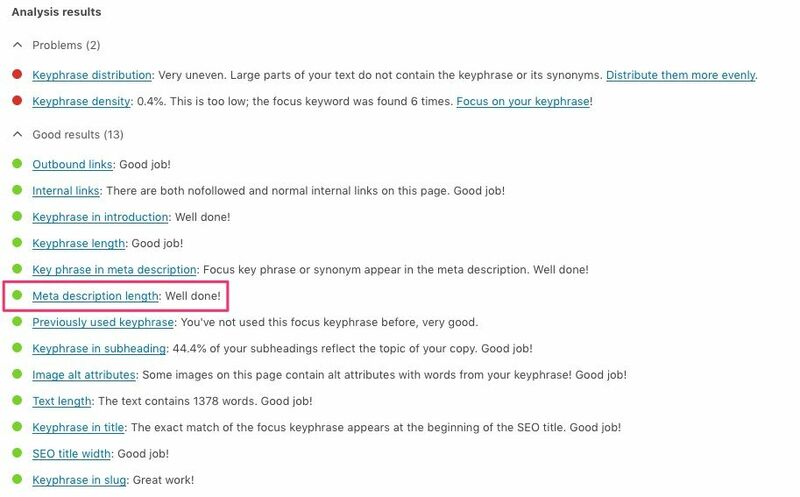 You can find the meta description field in the snippet editor of the Yoast meta box. What does the length meta description check do? This check measures the length of your meta description. It checks whether it is too short (less than 120 characters) or too long (more than 156 characters). Why is the length of your meta description important for SEO? Google sometimes displays the meta description beneath the title of your posts in the search results. This small piece of copy can entice people to click your page in the search results. If your page gets clicked a lot in the search results this is a signal to Google that your site provides what people – with a particular query – are looking for, which can boost the ranking of your page. Unfortunately, we can’t fully control what Google displays in the search results. Sometimes it decides to show the meta description, sometimes it grabs some sentences of your copy. Nevertheless, we encourage you to write a meta description. It’s still your best chance to convince people to visit your page and not your competitors’! If you check the search results in Google you’ll mostly see snippets with meta descriptions of 120 to 156 characters. Sometimes Google shows longer meta descriptions. We can’t predict when this happens though. Therefore, we’d recommend keeping your meta description between 120 and 156 characters. In that case, if Google decides to show your meta description you’ve written, it will be shown fully. How to improve your meta descriptions? A good meta description convinces people that your page offers the best result to their query. This means that you’ll have to find out what people are looking for when your page will show up in the search results. What is their search intent? Are they looking for an answer to a question? Then write down which questions you’ll answer, and why yours is the most complete. Are they looking for a product? Write down what makes your product stand out and why they would best buy it in your store. Be concise and convincing! Read here how to write awesome meta descriptions!